Hi I’m Megan, a veterinary nursing student from Melbourne Polytechnic doing five weeks of placement in the Stuart-Fox lab. As an alumnus of The University of Melbourne, I also have a research background looking at animal behaviour during my Masters of Animal Science as well as a passion for animal welfare. I had no idea about the husbandry involved in keeping animals for research, but I have been working mostly with PhD student Caroline Dong and learning all about taking care of her tawny dragons. Even though I have very little experience working with reptiles, I have transferred some of my veterinary nursing knowledge across and given a different perspective on some of the common health problems found in this population. I understand that keeping captive populations brings with it several challenges and limitations such as having the right diet and environmental conditions including lighting, temperature, UV radiation and substrate. If any of these are not quite right, this can have a big impact on the lizard’s overall health, and even when you do have everything as close to the real world as possible, things don’t always go the way you planned. The last few weeks has been quite the rollercoaster I wasn’t expecting, especially since the lizards have been breeding during the time I’ve been here. The first time I found a clutch of lizard eggs, it felt like something from Jurassic Park! Unfortunately, I will not be around when the eggs begin to hatch but I hope to come back and see for myself how cute the baby tawnies are. This placement has certainly exposed me to another aspect of caring for animals rather than the usual cats and dogs. This is also something not many people will ever get to see and so I am very grateful for the experience. 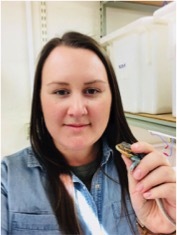 Megan has been an invaluable help for our breeding tawnies, and we also put her to work advising on some improved practices for our captives, as well as researching causes, treatments and prevention of some of the more common conditions found in captive lizards. Outside of our lab, Megan experienced some husbandry roles and responsibilities of other labs and animal facility managers within the department. She’s most welcome to come back to admire our many babies when they hatch!